Read here about a sculpture by Kenneth Snelson, shown at the 1964 New York World's Fair. The archway of the Tower of Light and its central feature were sculptures by Kenneth Snelson. Snelson and Howard were friends. They had worked together on the Museum of Modern Art exhibition in 1959. 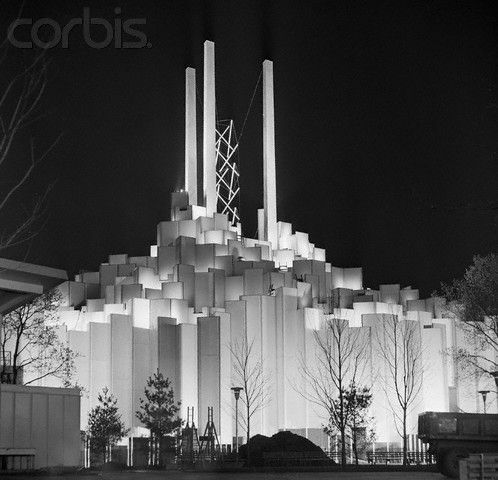 Howard admired Snelson's talent and the Tower of Light was designed to house and feature Snelson's tower sculpture. The entrance sculptures were added later. 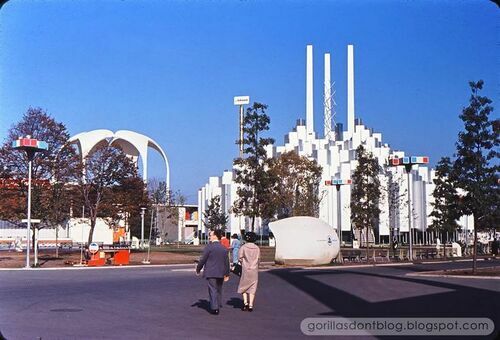 Construction began in May 1963. 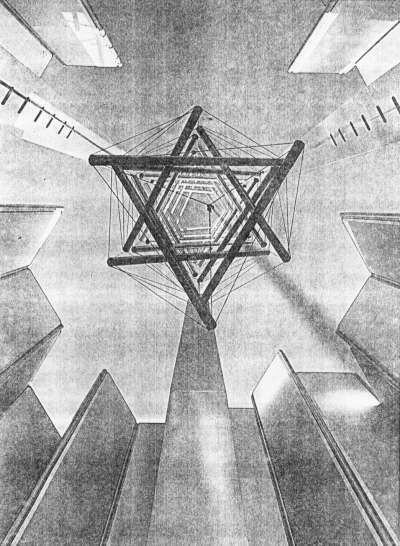 Snelson's sculpture in the Tower of Light, "Photonium," stood in the center. 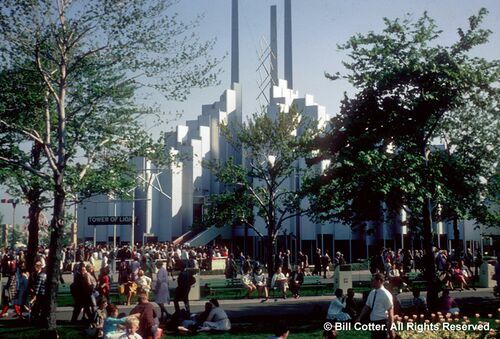 In addition a construction of suspended aluminum tubes measuring 30 X 35 feet adorned the entrance to the pavilion. Press attention mostly centered on the bright light projected, at the time the largest concentrated source of exhibition lighting in the world. Below are some videos and photos of this tensegrity artifact. A short video clip about the pavilion. Con Ed "Girls" Mary McGarry and Carol Green are heard recalling working at the pavilion. The entrance is seen clearly, a segment from "To The Fair", Producer: Thompson (Francis), Directed by Alexander Hammid and Wheaton Galentine. 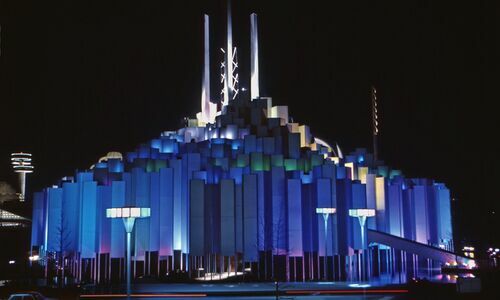 Tower of Light at night." Tower of light daylight, side view." View from the bottom, looking up, in the tower of light." 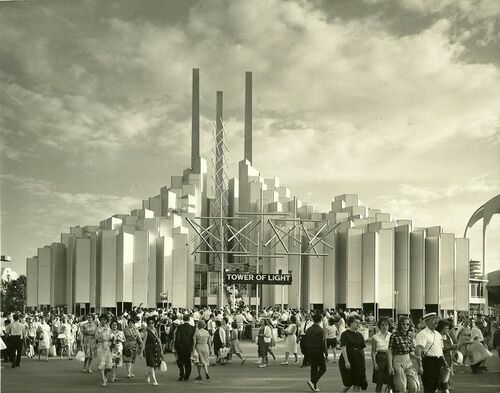 Tower of Light by Everett Collection/REX"
Tower of light view from the promenade." This page was last edited on 27 January 2019, at 10:48.